Use fresh or frozen peaches to make all of tour breakfast dreams come true. This cake is perfect for tea time too. It's an old fashioned recipe that will quickly become a an all time favorite. I thought it would be fun to keep the peach recipes coming. Peaches are one of my favorite summer fruits, even if they are a bit tricky. In their own way they are a bit like avocados; you wait and wait and wait for them to be at their peak and 10 minutes later they start to shrivel. So I always try to buy them a half dozen or so at a time and just do it frequently throughout the season, that way there are always good peaches ready to go. But still every once in a while, one sits just a bit too long. They are still good, but you can just tell that when you bite into it you will have peach juice running down to your elbows. It is delicious, but sticky! So if I find a couple of peaches got to that point, it is time to fire up the oven. You know, as if I need an excuse! I was trying to decide what to do with a couple of peaches before I hit the road for a convention. I knew they weren't going to make until I got home. The boys of the house had big plans of ordering a pizza while I was gone, a rare treat that would likely not include a side of peaches. Then it came to me. 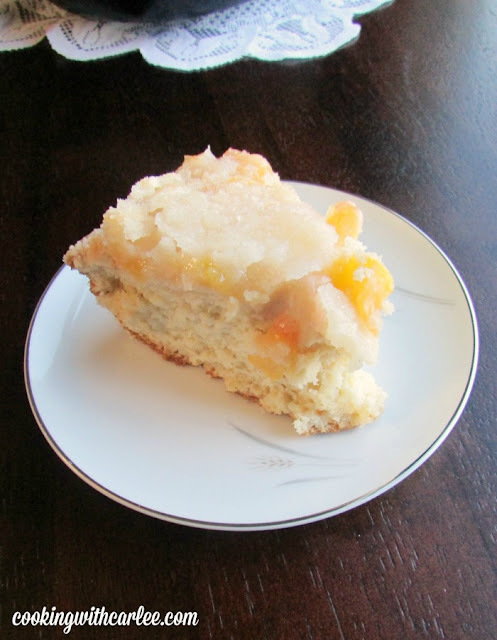 My Great-Great-Grandma's Apple Cake, but with peaches. You guys, it was good! This cake is meant to be a coffee cake. Perfect for breakfast or tea time. We actually had it for dessert. Sort of a last hoorah before I hit the road. 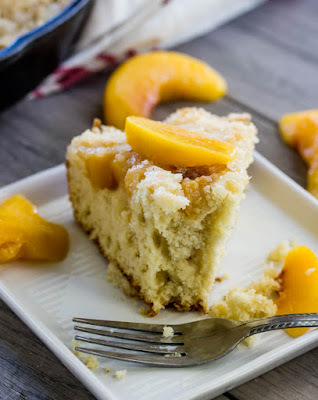 The peach version of this cake really tasted like a bite of sweet summer. I love this recipe too, because the hardest part is cutting the fruit. I don't even worry about peeling the peaches. I just dice them and go for it! The batter comes together with a bowl and spoon, no fancy equipment required. I baked it off in my 9" cast iron skillet because I love the look and feel of baking a rustic cake like this in a skillet. You can certainly bake it in a cake pan if you'd rather. I couldn't wait to cut into the cake. It just smelled so good. So I cut in while the sugar was still hot and the topping was still gooey. Oh my goodness. It set up more as it sat a bit and it was really good then too. So if things are coming up peachy in your neck of the woods, you need to check out this cake! A fun twist on my great-great-grandma's dutch apple cake recipe. Perfect for fresh or frozen peaches. 1. Preheat oven to 350 F and grease a 9" pan. (I used my 9" cast iron skillet, but a cake pan would work as well.)2. Mix together butter and sugar.3. Add egg and mix until smooth.4. Pour in milk and vanilla and combine.5. In a separate bowl, mix together flour, salt and baking powder. Fold into wet ingredients until incorporated.6. Spread into greased pan. Top with peaches and press lightly into batter.7. Mix topping ingredients in a small bowl until coarse and crumbly. Sprinkle over top of peaches. 8. Bake at 350 F for 40-45 minutes. The sugar should form a crust and the cake should be cooked through. Cool slightly before cutting and serving. Can be served warm or at room temperature. Oh how I wish I had time to win this up for my breakfast today!! Looks so yummy and I'm still finding uses for some peaches I have!! BTW, made your blueberry peach drink last night, YUMMO!!!!!!! So good I forgot to take a picture, lol!! Maybe this weekend, Andrea! I am glad you like the slushies, it sounds like you'll just have to make another!! I hope you have a lovely day! Can this cake be made with apples,and if so which kind should be used? Thank you. I am loving peaches this summer! 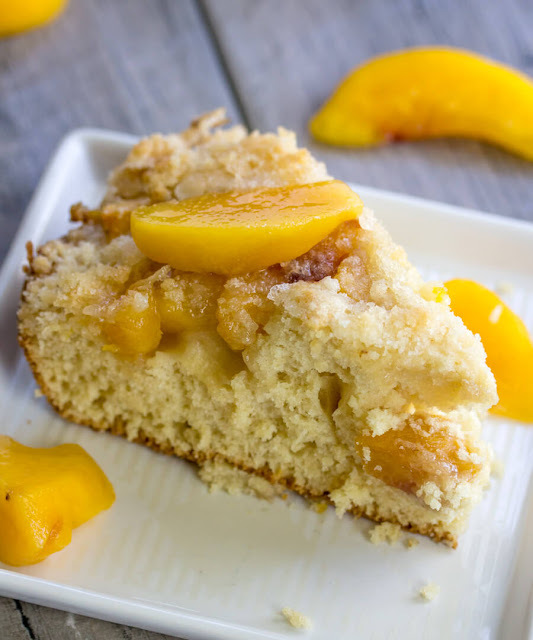 I just made a similar peach coffee cake and it was to die for. I want to try a slice of your version, too! We should trade slices next time! Thank you! Oh, I love peaches when they are at their peak! YUM! And I love peach cobbler, this looks so delish, what a great brunch or dessert item it would be! Pinning and yumming and stumbling, I am going to make this one! Delish! Thanks so much, Nikki! Peaches are definitely one of my favorites too. I think the small window of them being soooooo good just adds to the draw. 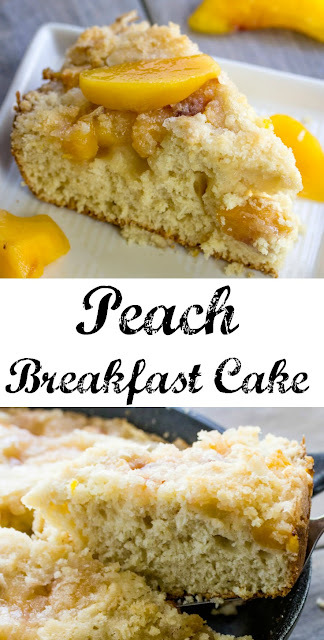 Three of my favorite things- peaches, breakfast and cake! Peach pie is one of my favorites, so I have to imagine it would be difficult for me to not like this either ;) Thanks for sharing this at #HappinessIsHomemade this week Carlee, love it!!!!!!! Thanks for hosting, Katie! I hope you give this a try. The apple version of this cake has been enjoyed by at least 6 generations of my family and this peach one gives it a run for its money! Oh this looks so good. My mom and daughter would love this, peaches are their absolute favorite. Thanks for sharing at You Link It, We Make It. Hope to see you back tomorrow! It really is a great way to use peaches. It comes together quickly too, which is always a plus! Thanks so much for hosting! Thanks, Marsha! That is awesome, you are so sweet! Your recipe is featured on Full Plate Thursday this week. Enjoy your new Red Plate and have a fantastic weekend! Thank you so much, Miz Helen!! This is a wonderful recipe! I can't wait to dry it. I have made something similar when peaches are out of season. I use canned peaches instead. It's cheating (just a little). But, everyone once in a while you just have to have peach cake/cobbler. Thank you for posting this delicious recipe! Canned peaches would be perfect for something like this! I'll have to remember that this winter! Thanks so much! Could you bake this in a bunt cake pan? It wouldn't be ideal for a bundt pan. It is a smaller recipe than most bundt recipes and the sugary topping would end up being under the cake rather than on top when you unmold it. What adjustments can I make if I choose to use buttermilk instead of milk? Add a 1/2 teaspoon of baking soda maybe? Oooh, now I want to make a buttermilk version! I would imagine a tad more baking soda to balance the pH would be fine. Though now that I think of it, I wouldn't be surprised if my great-great-grandma was using buttermilk and that is why she used baking soda instead of baking powder. I really want to try it now. Please let me know if you do! About how many peaches would you need to make the 2 cups? About 3 peaches would get you there. But you don't have to be exact either. That was a good amount to cover the top of the cake but a little more or less wouldn't hurt anything. Made this Thanksgiving with blueberries, as good as the one I made with peaches this summer. Oooh, I can't wait to try it with blueberries! What a great idea! Peaches, cake and cast iron skillet. You got me with this recipe! Yum! This looks delicious! Cake for breakfast, I could do that ;) I don't have a cast iron skillet anymore. I should really buy another, this would be a nice change for breakfast. You could definitely do it without, but the skillet adds that little something. I love mine! I am with you! Cake all day! I saw the video for this cake on Facebook, and it looks so delish! I need this in my life. Pinned and Stumbled so others can make this bit of heaven in your mouth! YES! I'll take any excuse I can get! Breakfast and cake ... two of my favorite things!! What a coincidence, mine too! Your recipe is featured on Full Plate Thursday this week. Hope you enjoy your new Red Plate and thanks so much for sharing with us! Marsha, that is such an honor! It would be perfectly ok to leave out during the day! I have served this at holiday open houses before and let people graze all day on it! Have fun with your company! I'd totally roll out of bed in the morning for these!!! Me too! It's totally worth having to get up for! What an absolutely Beautiful thing to wake up to in the morning! That is a lovely thing! I can't wait to make this! and I have a few jars of canned peaches on my shelf that we picked and preserved last summer, just begging to be used! Thanks for linking this up at our Brunch Week Party for Celebrate 365 Blog Party! Oh my goodness, this would be a perfect way to use them! I wish I had some home canned peaches! Can pineapples be used instead of peaches? I think that is a fabulous idea! I've done peaches, blueberries and apples but hadn't thought of pineapple yet! I dont understand where it says prep time 10 hours?????? I don't know how that got there! I think I have it fixed. Thank you, it definitely doesn't take 10 hours. 10 minutes is a lot closer! Ooo I wish I had fount this a couple of weeks ago before my husband and I started trying to eat healthier. This would just be too tempting to keep around! I need to make it when we have guests over so that I won't be tempted to eat the whole thing! Loving all the peaches! Pass me a fork! Another reminder that I need to buy peaches at the farmer's market...before they're all gone! Yes, get them while you still can! 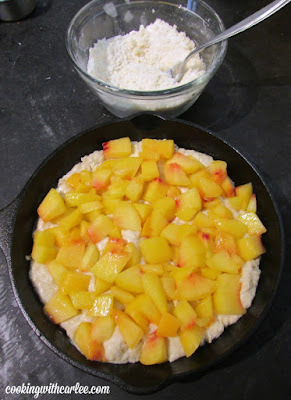 I need to pick up peaches and reseason my cast iron skillet! Cake for breakfast rules! Yes it does! And this is the perfect excuse! This cake looks so good! 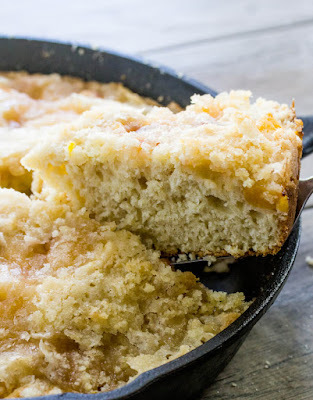 I love baking in my cast iron skillet, going to give this a try real soon! I love baking in my skillets as well, it adds that little something extra! hi- I don't have a cast iron skillet and you said a pan would be fine. What size baking pan for the amt. of batter there is? Thanks. A 9" cake pan would work perfectly. Or a square baking dish or 2.5-3 quart casserole should work as well. YAY! I am so glad you all liked it! I could eat that every morning! So glad you shared it on the cake and cupcake party for Celebrate365 blog party! What does the T stand for, tablespoon or teaspoon?